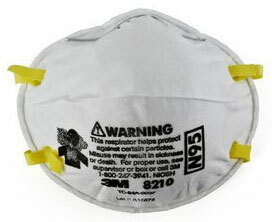 We sell 3M and Moldex N95 dust mask respirators. 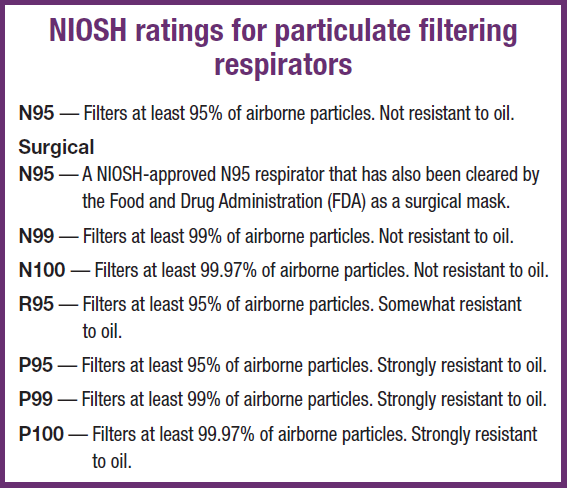 N95 refers to NIOSH (National Institute for Occupational Safety and Health), a safety agency that gives an official rating to respirators, masks, and filters for consumers. 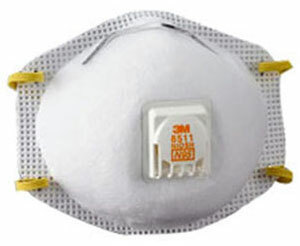 A rating of N95 means that a given mask is guaranteed to filter 95% of particles. 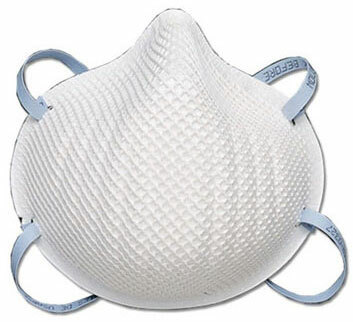 These 3M N95 masks can protect against concrete dust and wood shop dust as well as airborne pathogens such as H1N1, influenza, allergies, and swine flu. Check out our product guide below or head straight to the webstore if you're ready to buy. The type of respirator you select will depend on what type of comfort you require, and what type of particles you expectd ot be exposed to. The 3M 8210 is highly economical in price and is sold in bulk, ideal for meeting minimum OSHA standards for protecting workers. The 3M 8214 is specially formulated for welding with its cool-flow exhalation valve, breathable electret media, and cake-resistant filter. Moldex respirators feature a high level of comfort, with a molded nose guard rather than a metal noseclip, and a face seal secure enough to not fog up your glasses. If you need additional protection against hazardous materials such as lead dust, asbestos, acid gases, organic vapors, or chemicals), you may want to consider a 3M or North half mask or full face respirator instead. The 3M 8210 N95 particulate respirator is designed to help provide reliable worker protection against non-oil based dust particles such as wood shop dust and concrete dust. Its lightweight construction helps promote greater worker acceptance and comfort and increased wear time. Ideal for grinding, sanding, sweeping, bagging and other dusty operations. The 3M 8511 N95 particulate respirator is provide protection against non-oil based particles such as wood shop dust and concrete dust. The 3M 8511 respirator is well suited for work settings that involve heat, humidity, or long periods of wear. Ideal for concrete grinding, sanding, sweeping, bagging and other hot and dusty operations. The 3M 8214 N95 particulate respirator is well suited for maintenance welding operations, torch cutting, brazing, soldering, and metal pouring. Provides relief from nuisance level odors. Features include Cool Flow exhalation valve, adjustable straps, advanced electret media, comfortable faceseal and cake-resistant filter material. Nuisance level vapors not to exceed OSHA PEL or applicable exposure limits. 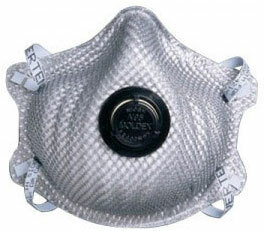 The Moldex 2200 dust mask is a popular respirator because of its high durability and excellent level of comfort. Most respirators do not fit comfortably and securely over the nose, but the Moldex 2200 does - so much so that it won't even fog up your glasses, thanks to its molded nose bridge that creates a seal without an uncomfortable metal band. Molded poly mesh shell resists collapsing in heat and humidity. Straps are securely attached so they won't break. Available with an exhalation valve for ultra-low breathing resistance. Flame retardants decrease shell flammability. Meets 42 CFR 84 standards. All N95 respirators are sufficient for swine flu, H1N1, and allergy protection. • Added carbon layer helps filter out nuisance levels of ozone and organic vapors (less than OSHA PEL). • For most welding applications. • Exhale valve reduces hot air build-up to keep workers cooler. 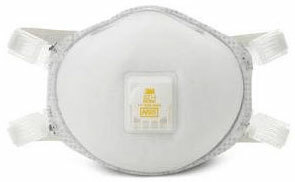 • Dura-Mesh® shell resists collapsing lasts longer so workers use fewer masks. • Flame retardants are added to the shell to help decrease flammability. • Contour molded nose bridge with soft foam nose flange provides all-day comfort. • Softspun® lining increases comfort and durability. • NIOSH certified to have a filter efficiency of 95% or greater against particulate aerosols free of oil. • Available in one size only. • 10 boxes per case. • Hot, humid and dusty environments such as welding, soldering and brazing, grinding, sanding, sweeping, bagging, stone quarrying, metal machining, cement, underground mining, polishing, buffing, lime, poultry and textiles. Welding and foundry operations, lab settings, agriculture, chemical processing, printing, food processing, paint and varnish manufacturing, waste processing and sewage treatment.